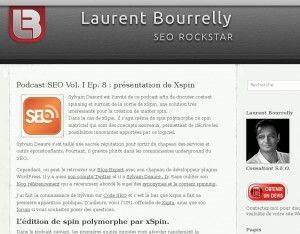 Laurent Bourrelly is a well known, and respected, French SEO consultant. We did a podcast about text spinning and the French version of Spinsynth. Google Text, morphing, Ecommerce website optimisation, content generation… We talked about content spinning possibilities, limits, and what does a polymorphic tool like SpinSynth add. Thanks a lot, Laurent, for those enlightening discussions. I’ve been lucky enough to be able to test this tool in beta and frankly, I just sat there with my mouth hanging open and drooling in front of my computer screen.